The International Lightning Class Association is now accepting applications for the 2017 Lightning Boat Grant Program. This award winning program is celebrating its eleventh year and presents recipients the opportunity to compete in one of the most popular one-design classes from June-October 2017. Two select teams will be chosen. These teams will receive a Lightning sailboat with all of the equipment necessary to compete, reimbursement for entry fees and gas and a mentor for the season. Candidates must be 19 years old. Applications and proposals are due by January 31, 2017. Please visit the ILCA website for more details on how to apply or for a 1 page info sheet to share or post at your club. In the words off 2016 recipient Gordon Wolcott, " Applying for the Boat Grant Program turnedout to be one of the best decisions my team and I made last year. I encourage anybody wanting a "FANTASTIC" summer sailing opportunity to apply. You never know what can happen in just a few short months." The Class is reaching out for help in spreading the word about this program. Please talk it up with the younger generation in your area! Encourage them to put together a team. This program is like leasing a new car without having to make any of the payments. It doesn't get much better than this! Over 10 years the Lightning Class has immersed 96 sailors into the Class and 9 have purchased a boat! We have seen a few weddings and now even babies from our Boat Grant Alumni! We are truly building the next generation of the Lightning Class. Help us spread the word on this great program and help someone from your area APPLY! In 2007 ILCA Class members Bill Fastiggi and Allan Terhune brought an out of the box concept to conception. 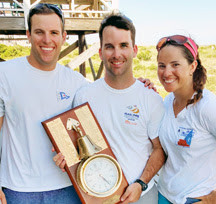 They were awarded the 2007 US Sailing Leadership Award for their efforts in launching what would become a benchmark program across the sailing community. 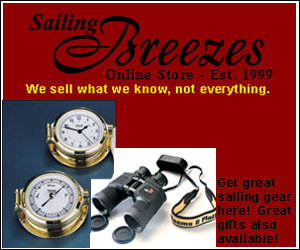 The Program gives selected young sailors an opportunity to experience Lightning racing at its best. In the US/Canada, the ILCA provides a competitive boat, insurance and substantial regatta expense reimbursement. The grant applications are reviewed and critiqued to listed selection criteria. The Class typically grants two boats each season but has granted up to five in one season. Each applicant is expected to sail in a predetermined number of races, maintain the boat and equipment and exhibit the highest level of sportsmanship. The grant is for use of the boat and equipment for one season. At the end of the season the boat may be available for purchase, depending on the situation. Each recipient is assigned a "mentor" for the season. By providing opportunities for young adult sailors to experience the Lightning we are helping to ensure the ILCA will be strong for many more years to come.